Presair designs and manufactures both momentary and alternate latching air switches. Used for many common applications, our air switches are a safe and economical solution. 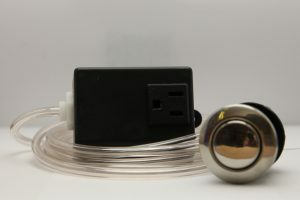 Using an air bellow to actuate the air switch, the user has complete electrical isolation from the point of actuation. If a user is looking for something to turn on as long as they are compressing air using a bellow or another source, this is a momentary air switch. Once the user removes contact with the source the device that is being switched is no longer on. Take our garbage disposal air switch for an example. As long as the user is pressing down on the air bellow the garbage disposal will run, once the user releases their finger from the bellow, the motor shuts off. Our pressure and vacuum switches also function as a momentary action. As long as pressure or vacuum is being sensed the switch will remain in the “on” state. Other common applications for our momentary air switches include laser hair removal equipment, sewer augers, shaved ice machines and MRI equipment. Now our alternate latching air switch needs to sense a pulse of air for ON and again for OFF. Let’s take our garbage disposal example again. If the user were to press the bellow and walk away, the garbage disposal would continue to run until the user presses again to shut it down. Other common applications for our alternate latching air switches include turning holiday lights on or off, spas, and motors. Paired with a push button or foot pedal air actuator, Presair air switches create a state of the art switching mechanism that is economical, safe and a low cost solution compared to other conventional controls. Click an option below to view more product details, or contact us to inquire about your application! Pingback: Air Switches, Foot Palm Switches, Pressure Vacuum Switch..